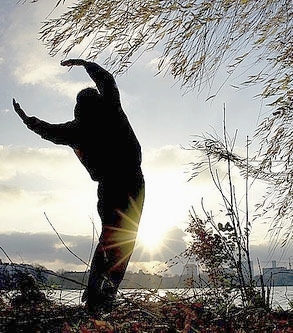 Qigong can be interpreted as the cultivation of our consciousness and energy. It has its roots in ancient China and India where healers, scholars, martial artists, and monks sought effective ways to expand their awareness, increase longevity, and raise the quality of their life experience. Some approaches to qigong can be very specific in their objective such as healing disturbances in the heart or lungs while others can fall into more than one category. For instance the Eight Pieces of Brocade, while designed for health and longevity, also assists in healing, supports martial training and can lead to higher levels of authentic self-awareness. In practice, Qigong involves the study and application of certain natural principles and how through their use we can realize higher states of our own true nature. These principles, and others, work together to strengthen and refine our chi circulation and the more subtle energy fields that surround us. It is an effective, enjoyable, and creative way to deepen our relationship with our higher human qualities while producing significant health benefits in the process.